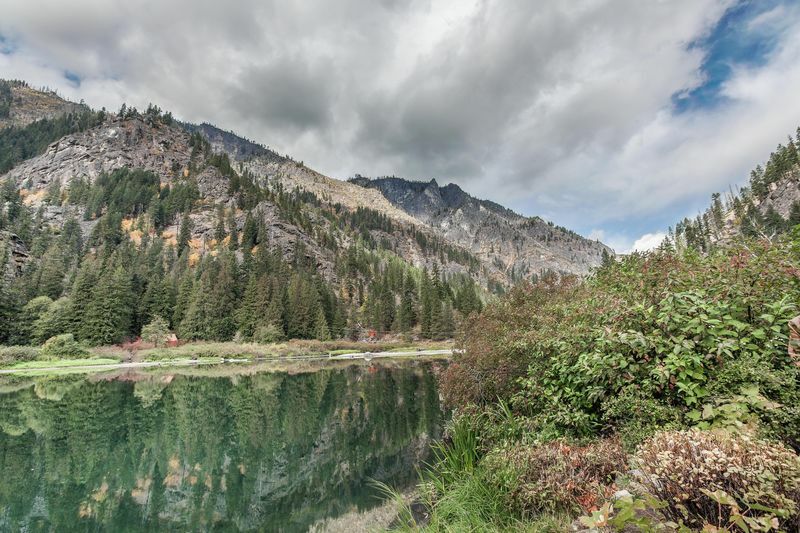 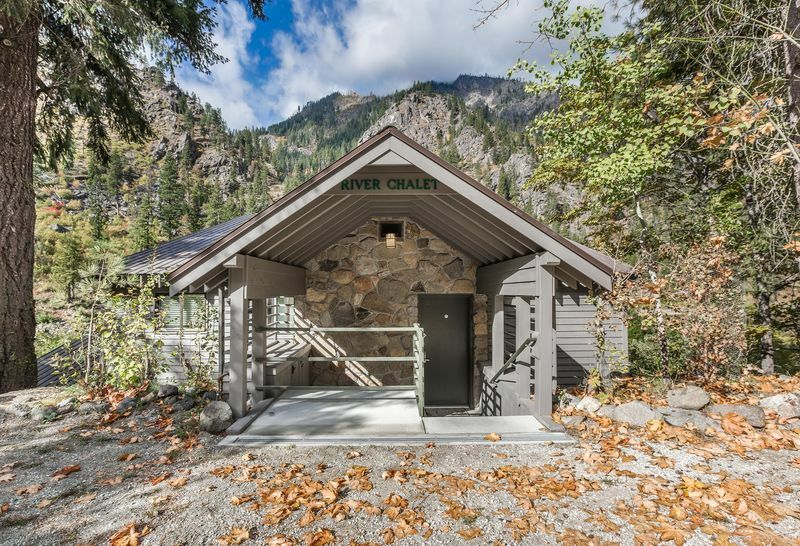 On the stunning banks of the beautiful Wenatchee River, just five miles west of the Bavarian village, River Chalet offers one of the most attractive and peaceful river settings you will ever find! 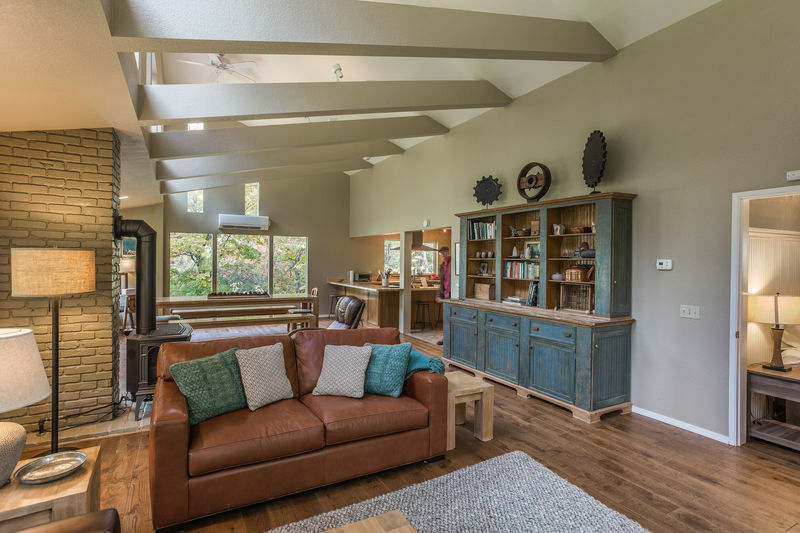 Recently remodeled with the expert design of local decorator Patty Bosket (“Au Naturel”), this lovely contemporary home is fully equipped, and is roomy enough for your whole family! 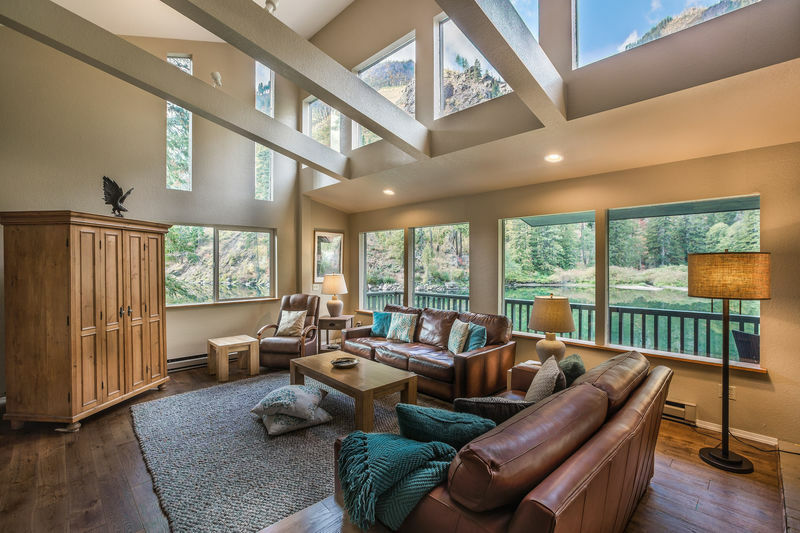 Cleverly constructed into the side of the river bank, this beautiful, spacious home is almost hidden from view at the entrance. 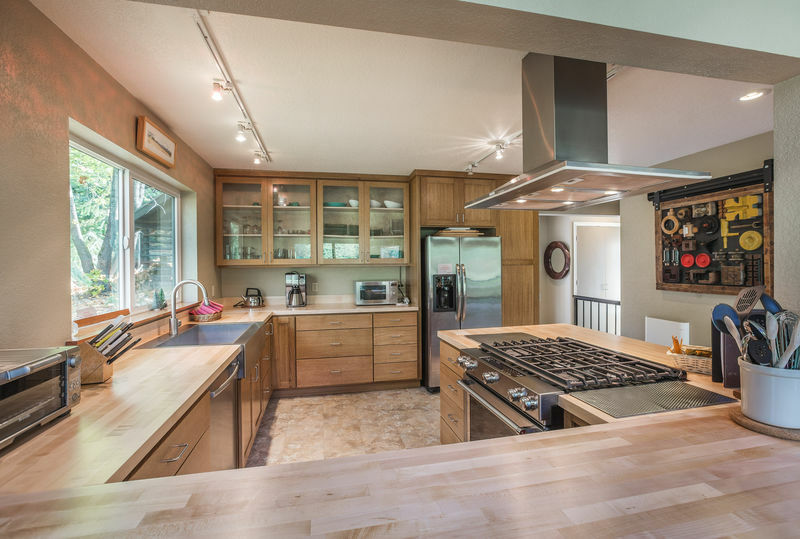 Just recently remodeled and updated, the new kitchen is beautifully designed and fully equipped. 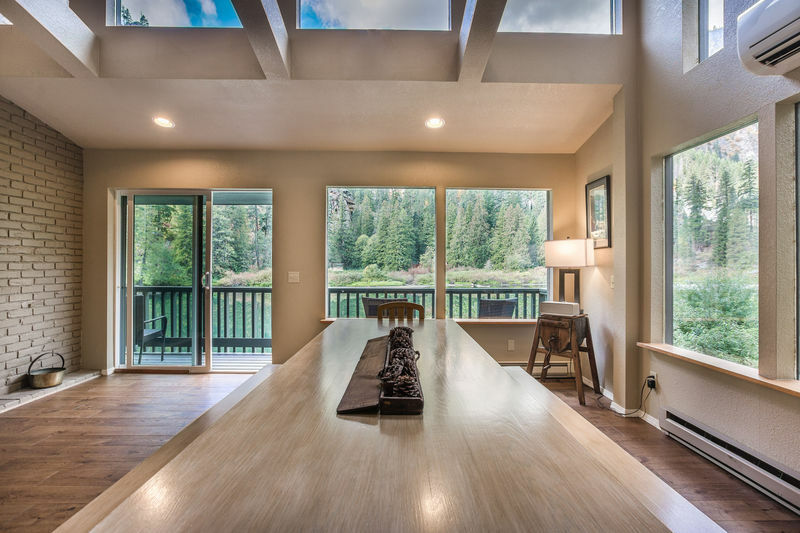 Surrounded by an absolutely remarkable river view–and panoramic windows to help you enjoy it– the open living room/dining room area is spacious, seeming to bring the outdoors inside. 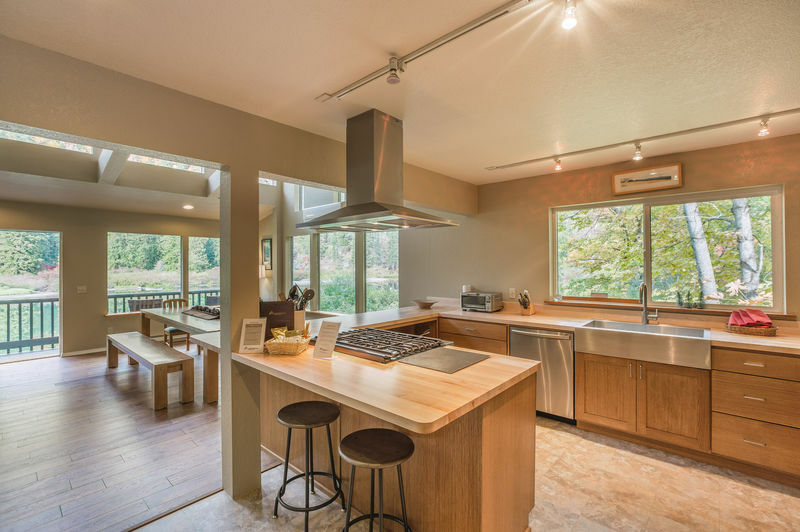 An oversized dining table and lots of comfortable seating will accommodate your whole group with ease. 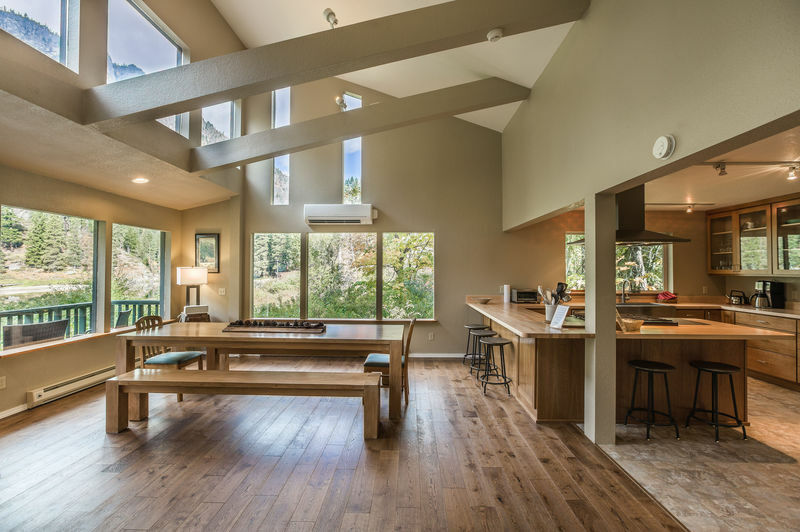 Cathedral ceiling with multiple skylights create space and airiness. 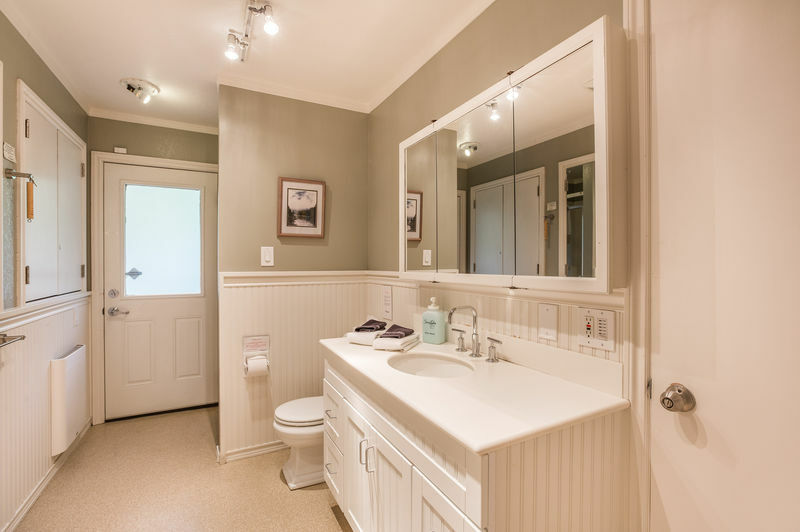 The master bedroom and large bathroom are situated on the main floor. 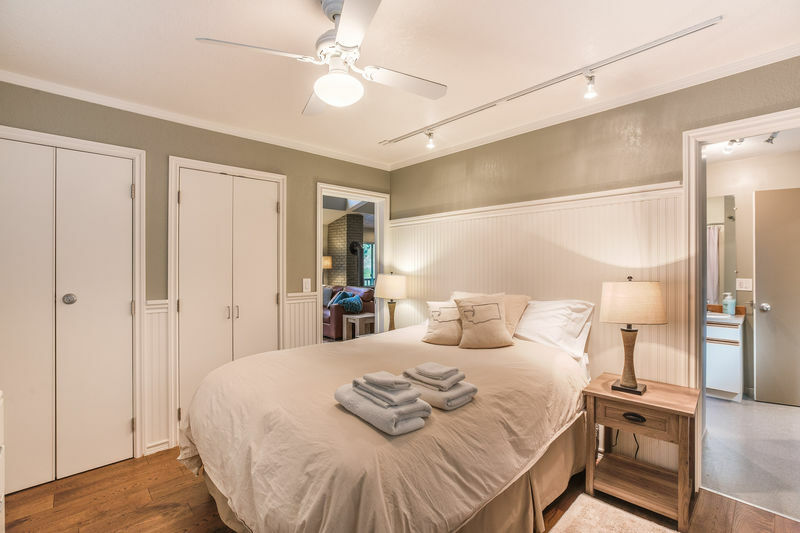 Three additional bedrooms all with European styled duvets, as well as a clever Murphy bed, are located downstairs, and well as a comfortable American comfort sleeper sofa in the living room. 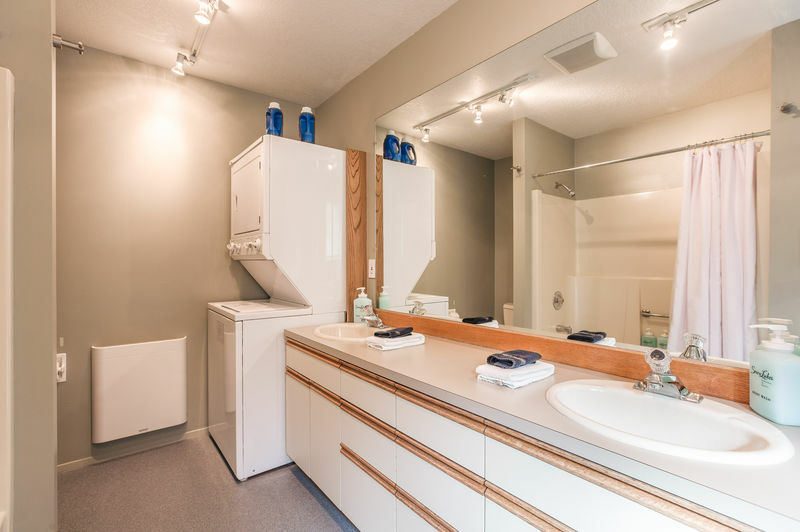 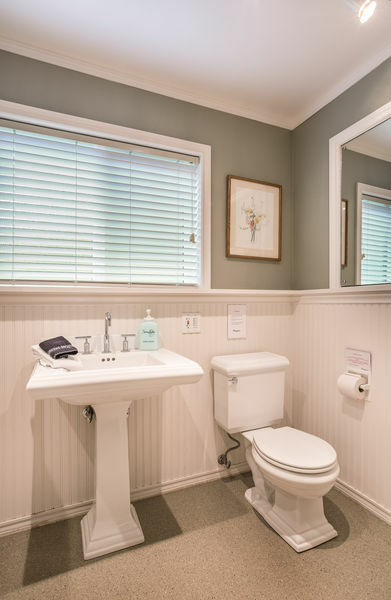 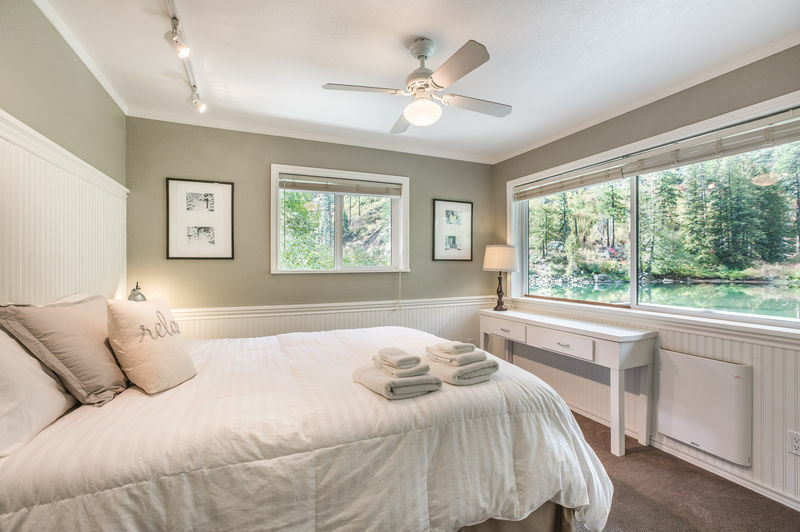 There are also two additional roomy and attractive bathrooms downstairs, one of which includes a door that leads to the private outdoor hot tub overlooking the river. 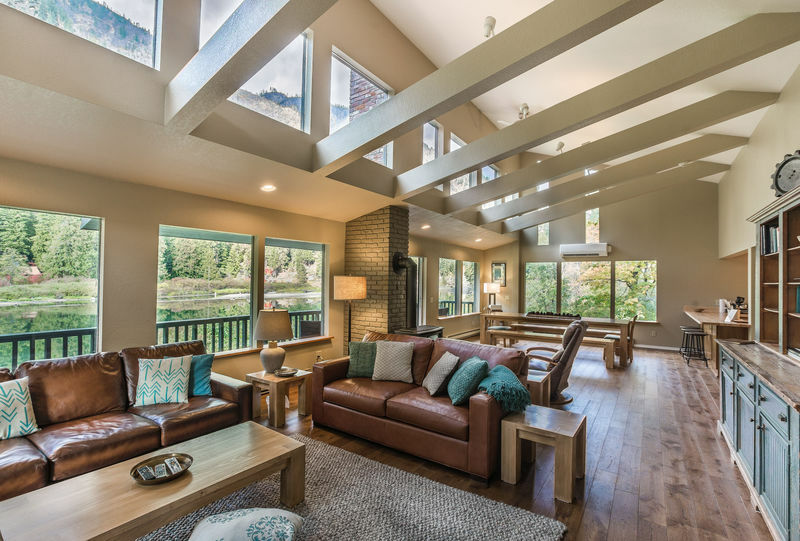 The downstairs hallway leads to a huge outdoor deck with lots of comfortable seating that overlooks the river– an absolutely perfect place for amazing serenity! 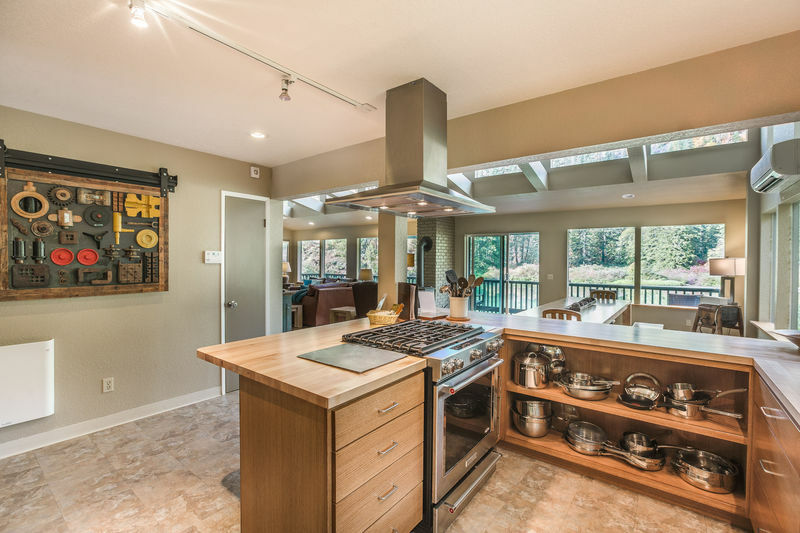 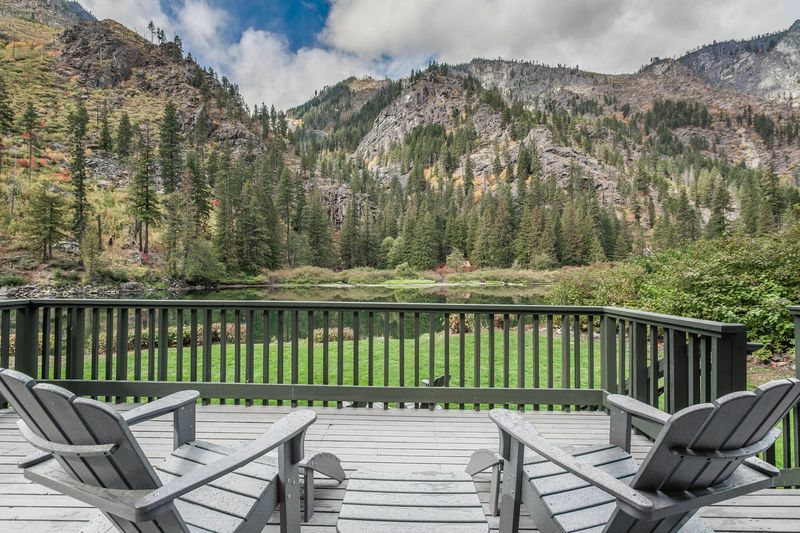 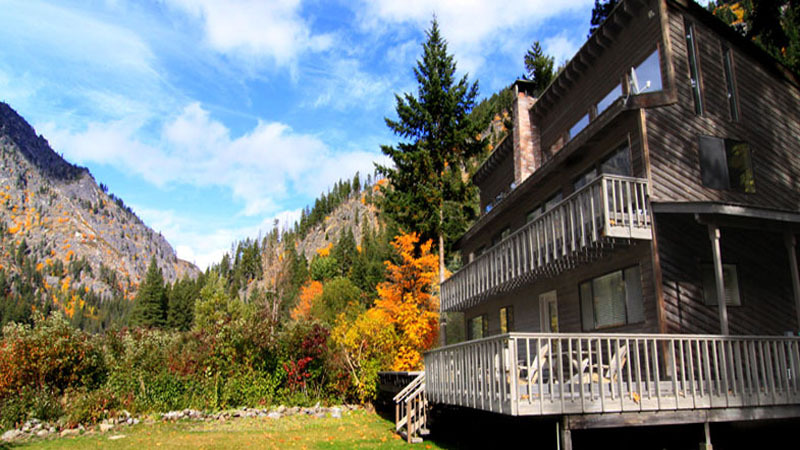 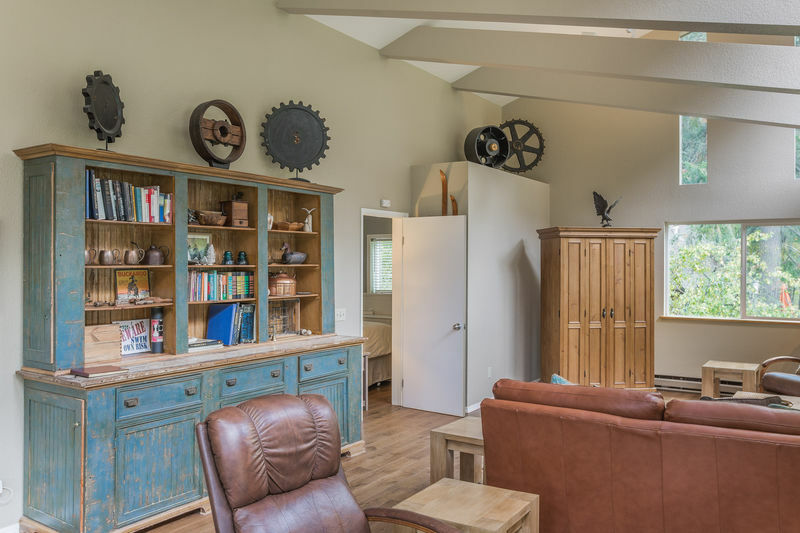 Just five miles west of Leavenworth, River Chalet conveniently close to shops, festivals, art, and theater– yet enjoys the blissful quietness, privacy, and seclusion of a peaceful wooded setting on the river. 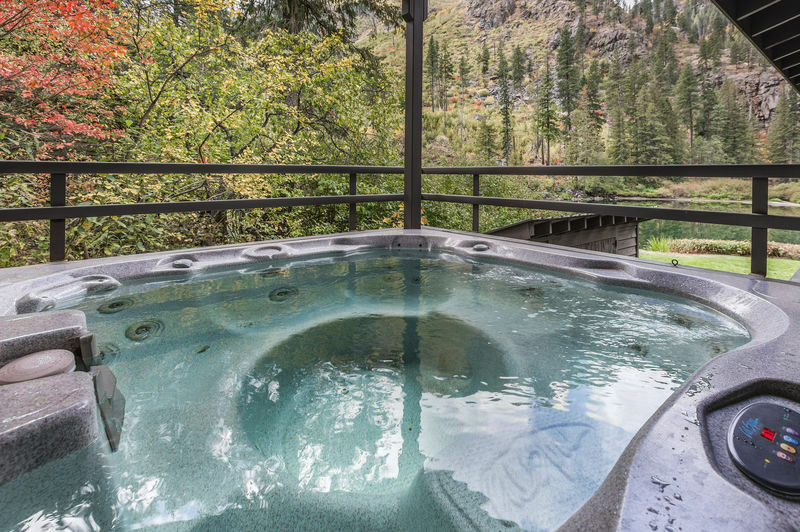 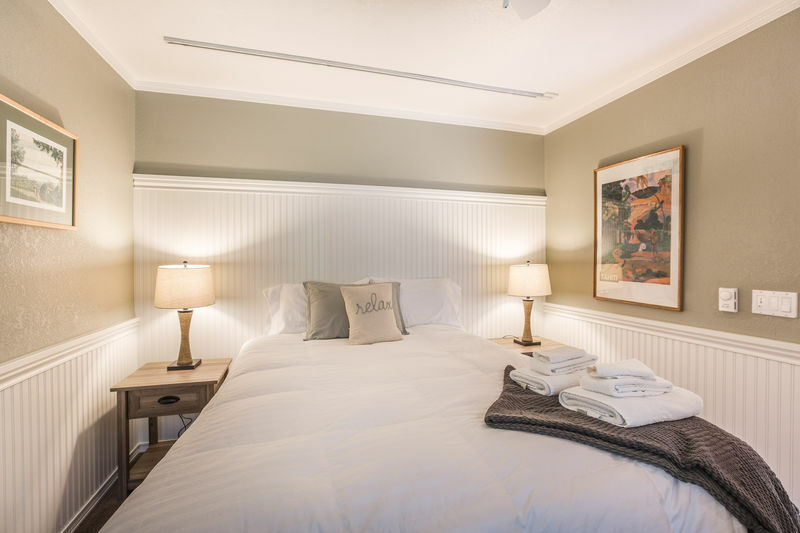 River Chalet will become one of your favorite ways to relax.